At StorQuest, we provide optimal storage conditions to protect your famed wine collection. Our state-of-the-art facilities offer the ideal environment to maintain the maturation of your prized collection. Our wine storage locations in San Rafael, CA, and Sarasota, FL, gladly accept shipments for added convenience. Cheers to that. Our staff has been specifically trained in providing you with exceptional customer service to ensure that your wine is in the best of hands. 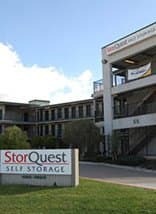 With StorQuest's commitment to your investment, you will never have to worry about the safety of your collecton.